Take the New Jersey Turnpike North to Exit 16W. Take Route 3 West, to Route 17 North. Stay on Route 17 North, go two lights to Union Avenue. You will see STAPLES on your right. Make a right at STAPLES. This is Union Avenue. Go one short block to DuBois Street and make a right turn onto DuBois Street. Then make a quick left turn into the Diamond parking lot. From the Lincoln Tunnel - Follow signs to Route 3 Exit. This exit will put you onto Route 3 West. 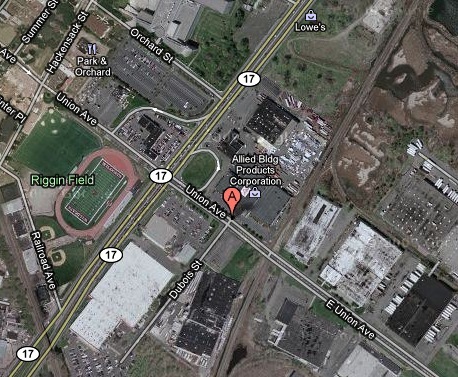 Take Route 3 West past Giants Stadium, to Route 17 North. Take Route 46 East. Follow Signs for Route 3 East towards the Lincoln Tunnel. Stay on Route 3 East and then take exit for Route 17 North towards Rutherford. Take the Garden State Parkway South to exit 153 on Left for Route 3 East.